Samsung overtook Nokia to become the world's largest cell phone maker in the first quarter. NEW YORK (CNNMoney) -- Nokia is now the world's second-largest cell phone company, ending a 14-year run at the top. Samsung took over the top spot, shipping 92 million cell phones in the first quarter, compared to the 83 million that Nokia shipped, according to IHS iSuppli. It was the first time since 1998, when Nokia surpassed Motorola (MMI), that Nokia was outpaced in cell phone shipments. Making matters worse for Nokia (NOK), S&P downgraded the Finnish company's debt rating to "junk" on Friday. That follows Fitch's similar downgrade earlier in the week. Nokia's decline has been a long time in the making, with shipments sinking by nearly 30% since their peak just after Apple's iPhone first went on sale in 2007. 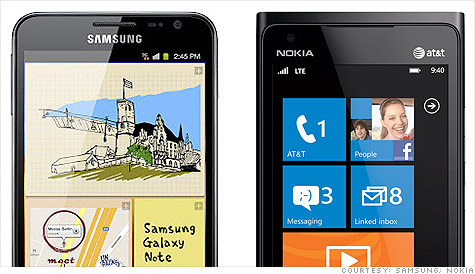 Samsung's rise mirrored Nokia's fall from grace. The South Korean company controlled just a third of Nokia's cell phone market share in 2008, and it has been rising steadily ever since. The overall cell phone market includes popular smartphones like Apple's iPhone but also older and less expensive phones that don't feature as many apps or other bells and whistles. Apple (AAPL, Fortune 500) sold 35 million iPhones in the first three months of this year. Nokia was the smartphone leader as recently as a year ago, but it has since fallen to a distant third place. But Samsung has also vaulted to near the top in smartphones. It was in fourth place in the smartphone race a year ago, behind Nokia, Apple and BlackBerry maker Research In Motion (RIMM). This past quarter, Samsung sold just 2 million fewer smartphones than market leader Apple, according to IHS iSuppli. Samsung has made a huge marketing push, and its fast, thin and unique devices have rivaled the iPhone in design and functionality. That has helped Samsung surpass HTC and Motorola as the Google (GOOG, Fortune 500) Android leader over the past year. "It's clear that the company's continued investments in smartphone hardware and software research and development are paying off," said Wayne Lam, senior wireless analyst at IHS. Next month, Samsung is expected to unveil the third generation of its very successful Galaxy S lineup. It has also embraced a number of different styles and sizes of devices, including its heavily marketed Galaxy Note tablet-smartphone hybrid, which comes with a pen. "The company is not only cashing in on the market's shift to smartphones, but is also succeeding in other cell phone product categories," Lam continued. "Samsung is likely to make further progress in market share in 2012." Meanwhile, Nokia's transition to Microsoft's (MSFT, Fortune 500) Windows Phone is just getting underway, and its feature phone business is stalling. That's not surprising, since the smartphone category is forecast to be the only part of the cell phone market to grow this year: Global smartphone shipments are set to rise by 35% this year, IHS iSuppli expects, while feature phones, entry-level phones and ultra low-cost phones will all decline. That's a problem for Nokia: Smartphones accounted for just 14% of the company's cell phone shipments last quarter, compared to 34% for Samsung. Did Samsung sell more smartphones than Apple?